I was recently invited to try a food truck called Eat Chicken Wraps. 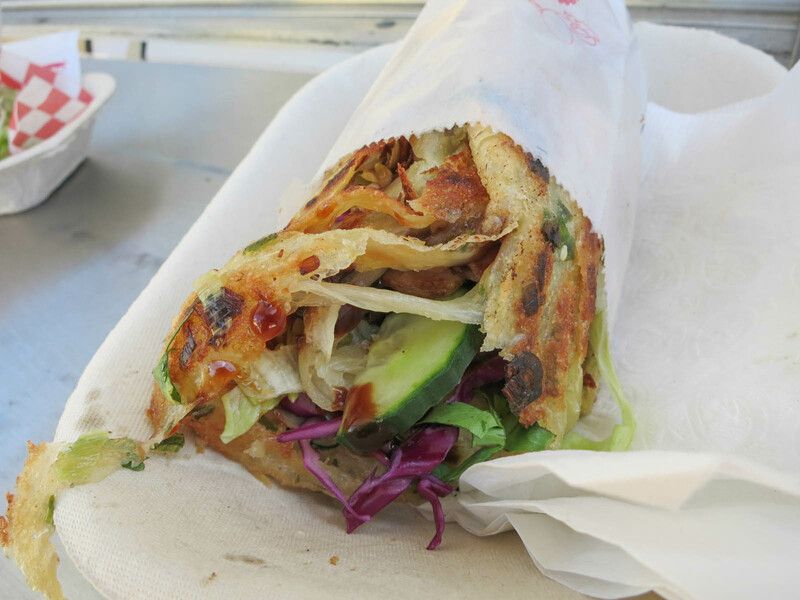 They are always located by Robson Square and they are open from 11:00 am – 9:00 pm. Like their name suggests, they specialize in chicken wraps and they take influences from various different types of cuisines. I had the hoisin chicken roll ($7), which is wrapped in a crispy Chinese pancake and filled with five spiced chicken, Asian salad, pickled radish, green onion, and hoisin sauce. After one bite of this wrap I loved it. The crispy Chinese pancake is so delicious. It is warm and flakey with a nice crispy texture. It is such a unique idea that I haven’t seen executed like this before. The fillings inside were equally as good as the wrap. There was lots of chicken inside and it was very moist and tender. The hoisin sauce had a nice subtle sweet flavour to it and there was a good amount inside; Enough to coat everything, but not too messy or soggy. All in all, this wrap was amazing and one of the best things I’ve eaten from a Vancouver food truck in a while. It is definitely worth a try. 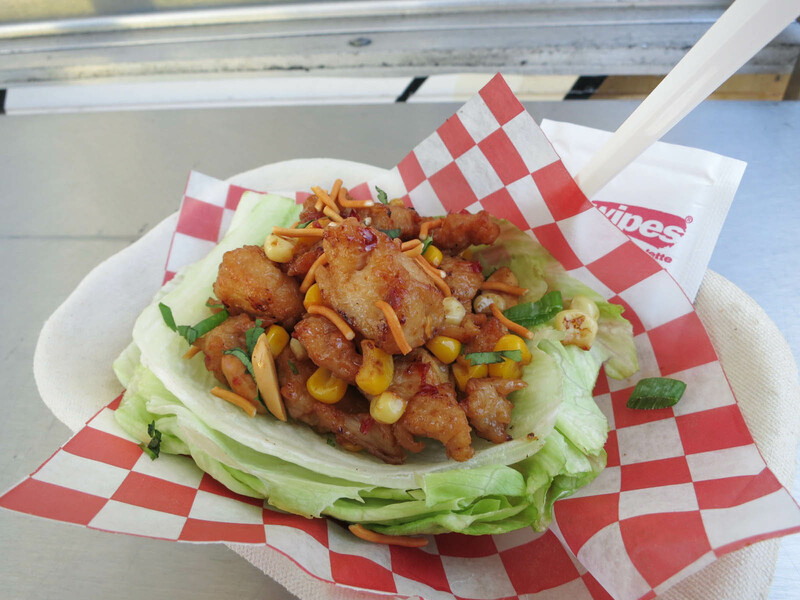 I also tried a kung pao chicken lettuce wrap (2 for $7). The iceberg lettuce cups are filled with chicken breast, corn, water chestnuts, peanuts, kung pao sauce, and sesame chili oil. I love how fresh lettuce wraps always are and this was no different. They give you a good amount of lettuce on the bottom to hold all of the fillings, so it doesn’t collapse and fall all over the place. The filling was very meaty and tasty. There were some nice big pieces of chicken in it and it was much more substantial than your standard lettuce wraps you get at restaurants. I really liked the sauce they used. It was a bit sweet and it also had a spicy chili kick to it. If you are really wimpy with spice, it may be too much for you, but I thought it was the perfect amount to tingle your tongue, but still allow the other flavours to come through. I was thoroughly impressed with Eat Chicken Wraps and they exceeded my expectations. The hoisin chicken wrap is a must try item and I appreciate how their items are actually affordable and all under $10. It is also cool how they are open in the evening for dinner time, since most other carts aren’t. Eat Chicken Wraps is a great addition to the Vancouver food scene. Yes, for great and affordable street food.